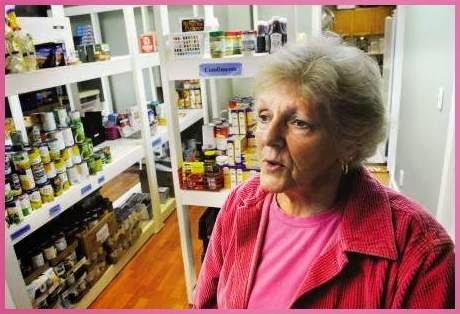 Reflections contributor and special friend, Nina Andry, was featured this week in an online newspaper that hailed the fine work she and other volunteers do at the Newmarket Food Pantry in Newmarket, NH. Feeding people and pets is one of her passions. Bless you Nina, for doing God’s work. NEWMARKET — At the Newmarket Food Pantry, the shelves of the small front room are stocked like a miniature grocery store and people are waiting outside for their turn to choose from them. But, like many food pantries across the state, the shelves are struggling to stay full. Nina Andry, the manager of the food pantry, goes through the list of items they're always short on: canned chicken, canned fruit, peanut butter, cereal, pasta, spaghetti, and sauce are at the top of the list. "Its fall, and a lot of people are looking for soup," she said. Other items, like toilet paper, are always in high demand as well. The pantry has a dedicated set of volunteers that typically come in an hour before the pantry opens to sort through a shipment of items from Panera Bread in Portsmouth, and they all separate and bag bagels and assorted breads to be distributed. "It's a passion of mine" Andry said. "It's one of my passions to feed people." Andry is also proud of the small pet pantry area, where cans of dog and cat food are displayed. "Everybody needs help, not just people," she said. "We have a few people who bring food every week, some who bring bags here and there when they can." Andry said the pantry, which is located in the basement of the Newmarket Community Church, is working hard to get the word out about its presence in the community. She acknowledged that times are tough and the pantry could always use more donations. Kathy Harter, a volunteer from Newmarket, says the pantry gets a lot of its supplies from the New Hampshire Food Bank in Manchester, which is also struggling to keep its shelves full. "It's a lot of work to do a food bank run," Harter said, "and that's assuming they even have it." Andry said bags will go out to some neighborhoods this week and will be collected on Saturday, Oct. 12. This effort will go on for the next few weeks, with collection day always being a Saturday, according to Andry. The pantry is kicking off their Neighborhood Food Drive this week. During this food drive, paper bags will be dropped off in neighborhoods, and then collected on a designated date. The project is designed to be more convenient for people looking to donate. "We're hoping that it might take off," Andry said. "What's good about it is residents don't have to do a whole lot, we supply the bag and drop and pick it up. All they have to do is put some stuff inside the bag... We're just working really hard to get the word out." Harter emphasize the human aspect of what they do. It's important to always "treat people like people," Harter says. "Why not make it nice for them? Everyone has a story, and a smile and a laugh can go a long way." Joan Dickerson, a Newmarket resident, says she's been coming to the pantry once a week for eight or nine years. She says she always knows how she's going to be treated when she comes to get her groceries. "Everyone has a great sense of humor, and is very conscious of what you need." The Newmarket Food Pantry is open 10-12 a.m. Fridays and Saturdays. For more information about donations or volunteering, please call the Newmarket Community Church at (603) 659-3892.